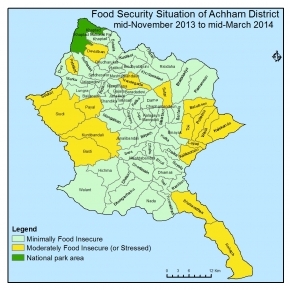 Achham district is minimally food insecure during this reporting period. Out of 75 VDCs, 40VDCs of cluster A , 1 7 VDCs of cluster B and 18 VDCs of cluster C are minimal food insecure. HHs food stock in cluster A, B and C is sufficient for more than three months due to harvest of summer crops. Market price of rice is increased by 9% than last year whereas decreased by 5-6% than last cycle due to new harvest of paddy in tarai and frequent road access. Main food staples in key markets are sufficient and supply is continuous. People are using traditional coping mechanism by selling pulse, fruits, vegetable, cash crops and doing daily wage work. This is season of migration to India for wage labor after completion of agricultural work. No any significant natural disaster and cases of diseases occurred and the security situation is generally peaceful. So combining and analyzing all the indicators of food security, Achham district is identified as food secure and comes under food security phase one. The overall situation is expected to detorate in next cycle as there will be no new crop harvetment and HHs will have to relay on limited food stock. Key markets will have sufficient food stock to meet the demand as roads will not be blocked. Market price of rice will be in increasing trend. The situation in Cluster A and B will remain similar as the summer crops production was normal and most HHs have balance food stock for more than 3 months. Moreover most VDCs are road head touched and there are good oppourtunities of wage employment. Situation in Cluster C will detorate due to no new crop harvestment in upcoming cycle, wage employment oppourtunities will be limited due to cold and snowfall and people will cope by borrowing food and money.